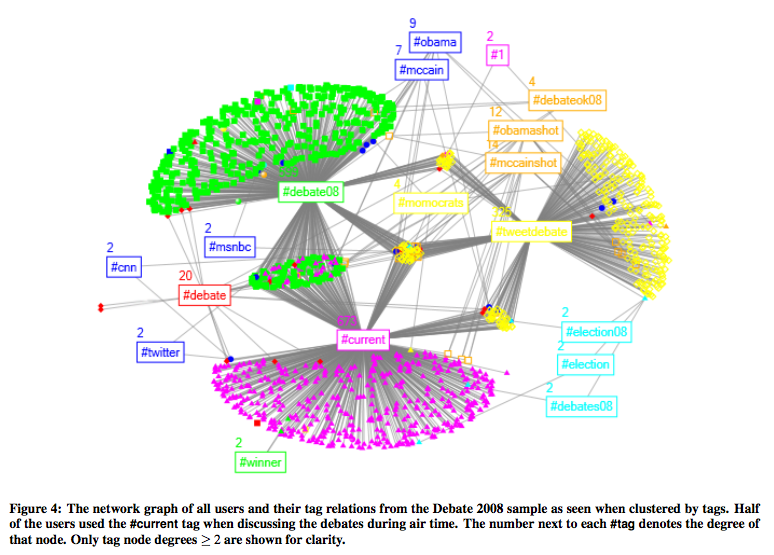 A recent paper makes use of NodeXL to create illustrations of data from connections among twitter users drawn from the United States presidential debates in October 2008. One illustration highlights the major clusters in the network. Authors: Shamma, D.A. ; Kennedy, L.; Churchill, E.F.
We investigate the practice of sharing short messages (microblogging) around live media events. Our focus is on Twitter and its usage during the 2008 Presidential Debates. 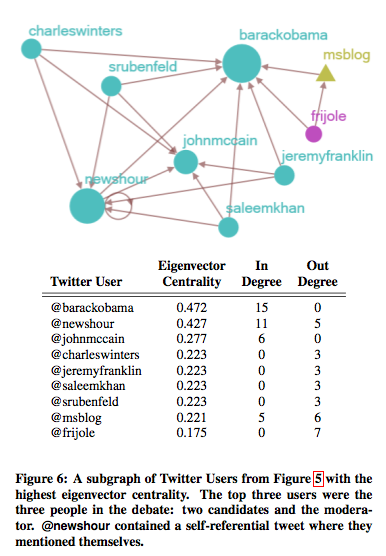 We find that analysis of Twitter usage patterns around this media event can yield significant insights into the semantic structure and content of the media object. Specifically, we find that the level of Twitter activity serves as a predictor of changes in topics in the media event. Further we find that conversational cues can identify the key players in the media object and that the content of the Twitter posts can somewhat reflect the topics of discussion in the media object, but are mostly evaluative, in that they express the poster’s reaction to the media. The key contribution of this work is an analysis of the practice of microblogging live events and the core metrics that can leveraged to evaluate and analyze this activity. Finally, we offer suggestions on how our model of segmentation and node identification could apply towards any live, real-time arbitrary event. At the core of the network are the entities that have the most “eigenvector centrality” which turn out to be the major participants in the debate. After ten years at Microsoft Research I have decided it is time to move on. My time at MSR has been a remarkable one. I have had the opportunity to work with very smart and focused people intent on making technical strides on many defining aspects of computing. It has been a pleasure to work with many talented people to bring better analysis of social media into the user generated content creation and consumption loop. We built tools to data mine and visualize conversation repositories to give participants and managers better reports on their activities. We discovered the ways participants in social media repositories perform different roles that can be identified by different patterns of computer-mediated interactions. We applied those ideas to personal email triage and patterns of email usage. We pushed ideas related to mobile devices and location based social networking and object annotation. We built a number of tools for visualizing the patterns and (social) network structures in the data created by the use of computer-mediated interaction tools. These projects point towards a world in which computers and mobile devices do more than connect us to the network, they will sense the world around us and reason about both our location and who is with us. Combined with back-end data mining, new mobile sensor studded devices are coming that will alter the nature of social interaction in its last, most analog hold out: face-to-face, co-present interaction. I want to explore this change in the nature of what the sociologist Erving Goffman referred to as the “interaction order“. We are living through the early stages of the “electrification of the interaction order”, a time in which the ways we interact with one another is changed dramatically by the availability of mobile social information networks. Online social networking, content sharing and discussion systems have effects that are multiplied when channeled through a device carried by every person and active in every interaction, however fleeting. Imagine going to a business meeting or conference and having Facebook suggest that you link to the people you spent the longest time talking to. Mobile social computing will add more content to the torrent already generated by “desktop” experiences. Some projects are already digging into this area: good examples include companies and products like nTag.com, SpotMe.Com, and the many trail and path tracking applications now appearing in the iPhone AppStore. Scott Counts and I wrote about a location based social networking application that demonstrated many of these features as well as search and matching features that have yet to appear in the first wave of production systems. A first step in this direction is to focus more on the analytic back-ends that will be needed for the management of all forms of social media repositories. Community analysis servers that provide a dashboard of community health and activity indicators will be a critical differentiating feature for community hosts, managers, and leading participants. Successful communities will be those that can cultivate contribution the best while managing conflict at the lowest cost. Once desktop bound social encounters are channeled through an analytics console more real-world events sensed by mobile devices can be added to the mix. I am looking forward to some time to push back and reflect more about these changes while looking around for new ways to explore them. I will take some time to get my family settled into our new home in California. I hope to catch up with many people! I will also be visiting Yale, University of Maryland and Berkely for talks this fall. I plan to attend the Microsoft Research Social Computing Symposium in Redmond (it will be good to be back!) 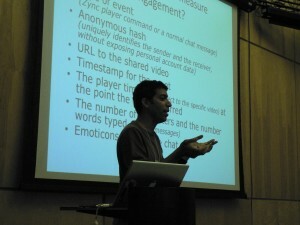 and the Conference on Information and Knowledge Management (CIKM) in Sonoma. 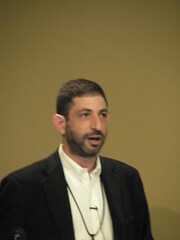 My old masmith@microsoft.com email address is no longer active, so please contact me at marc.smith.email at gmail.com. I look forward to staying in touch with my many friends and colleagues at Microsoft while finding the time now to meet with a wide range of people interested in social media.